Clemson’s ascension to college football royalty is complete. The school’s second national title — and first since an Orange Bowl victory over Nebraska capped the 1981 season — was years in the making. Dabo Swinney took over the reins at Clemson in 2008 and the Tigers have been on an upward trajectory ever since. 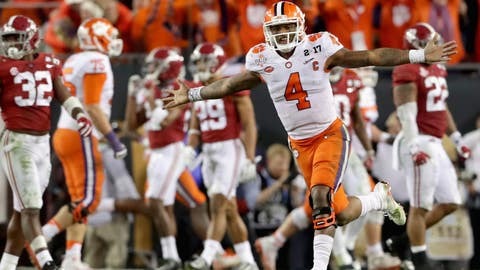 Last season’s championship game loss to Alabama could have been the pinnacle for the Tigers, but instead they navigated back to the College Football Playoff Championship and avenged their loss to the Crimson Tide. 17 2016 Clemson 28.3 20.4 29.8 National Champions! Clemson struggled against the elite field, finishing 17th out of 19 teams in winning percentage. The biggest shortcoming for the Tigers was a defense that yielded the most points of any team in the simulation. It was a solid unit during the 2016 season though, holding opponents to 18.0 points per game, which ranked 10th nationally. While Alabama might have come up short in this year’s title game, the Crimson Tide still placed four teams in the tournament, more than any other school. Bama was dominant in the simulation, as its representatives averaged a 70.8 winning percentage and nabbed three of the top four spots. Only the 2015 champions finished outside the top four. Are you interested in creating your own college football dream team? Check out WhatIfSports.com’s college football Dream Teams feature and start loading up your roster with guys like Vince Young of Texas, USC’s Reggie Bush, Justin Blackmon of Oklahoma State or TCU’s LaDainian Tomlinson. Then simulate your roster against other dream teams or any college football program, past or present. Best of all, it’s FREE!